I've been fooling around with the Data Explorer for a while, and I was very confused when I ran the following query on Codereview, and got back unexpected results. When I ran this query, I got back the following results. 51332 Scimonster     3   229  <-- What the heck? 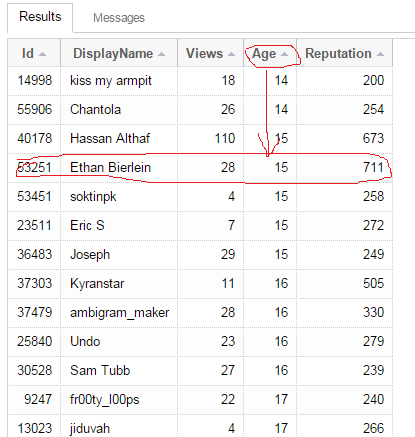 53251 Ethan Bierlein 28  711  <-- I'm not 28! This is very odd, although it doesn't stop there. When I run this next query, it says that my age is 15. The below are the results I get from running this. Ethan Bierlein 15   <-- This still isn't correct! Does anyone know why this is happening? I'm also noticing other values, as seen in the first table of results, not seeming quite right. Not the answer you're looking for? Browse other questions tagged discussion data-explorer users . Which tools and technologies are used to build Data Explorer? I'm being logged into Data Explorer as “jon.doe18”, why? Why does the data explorer have inaccessible columns?